Can I play Nintari and ignore you? William J. Beamish Journal #5 - I had the strangest dream! Alicia, our new babysitter, was a vampire out to eat Brianna and I. I fought her off using a vacuum cleaner and a can of hairspray! It was an epic battle, but then I woke up. It was just a dream, right? Now, it’s time to head to West Frumpton and sign up Horny for a frog jumping competition! When we last left our hero, Willy had just figured out that he can use the cola to supercharge his frog to win the jumping competition, and we had secured Dana’s participation by bribing her with a shirt. But as soon as we got home, Willy got a surprise for the evening: a new babysitter! His parents were heading out to a barbeque and someone needed to watch Willy and Brianna. Where Tiffany was during all of this isn’t stated, but perhaps she had a date. 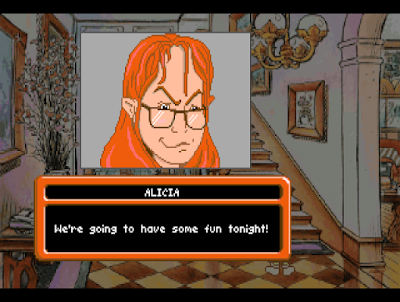 Our new sitter is Alicia, a suspicious-looking woman that Willy calls the ugliest person he’s ever seen. He’s probably biased. We also get a new chore to do: vacuum the living room after dinner. Duffy has been shedding all over the furniture. Just one more thing to remember to do, but it doesn’t seem like too much of a problem. After Mom and Dad leave, Alicia cooks dinner and we sit down to eat. Willy is bored by having macaroni and cheese again, but Brianna thinks it is pretty good. But all is not as it seems... Willy’s fork starts to march across the plate by itself-- the macaroni is alive! It was worms cleverly disguised as macaroni. Brianna throws her plate at Alicia, covering her in cheese. But before either of them can react, Alicia transforms into a giant flying bat. Willy and Brianna run like heck. I captured the whole babysitter sequence for your viewing enjoyment. The power of imagination? Or a strange diversion into a new genre? Willy runs into the living room where his parents have helpfully laid out the vacuum cleaner. Alicia-the-bat flies around the room menacingly. While I’m pausing to explore a bit and see what’s clickable, Alicia swoops down and grabs me and carries me off into the moonlit night. The end. Is this the real life? Or is it just fantasy? I’m not sure how to take this. Am I supposed to think that this is a game that Alicia is playing with the kids? She did tell them to “use their imaginations”, after all! Or does this game really exist in a universe where vampires are real? I do not have any objections, but thus far the whole event has been very well grounded. We have to do chores and worry about grades and playing Nintari. We have an evil plumber and corporate overlord. But monsters? We had a bit of a hint two posts ago when Willy tried to go outside after dark, but I assumed that was just his overactive imagination. Either way, the game is really “the end” so how are we going to get out of this one? I restore and move more quickly this time. By quickly clicking on the exits, I can move from room to room. Each time, Alicia follows me, but as long as I keep clicking it seems I can avoid the babysitter-bat. The first thing to try is the obvious one: using the vacuum. A dead mouse (ewww) in Brittany room, recently killed by her kitty friend. A can of hairspray in the bathroom. Looking at the spray gives me a great hint: it will even hold in jet exhaust! Oh, 90s hair how I do not miss you! I try to use the spray in the bathroom, but it doesn’t do anything. But, I think I have a plan! I run back down to the living room. Or, I would have except I took too long and got carried off again. The end. It might not be the right time to bring this up, being chased by a giant bat and all, but I love the detail that the developers put into the animation in this sequence. 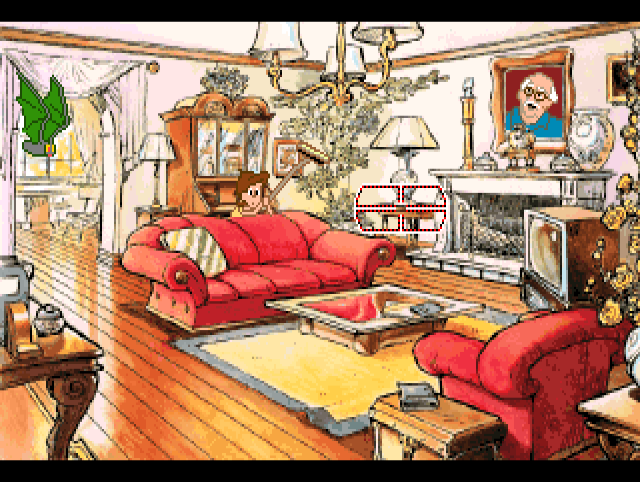 As Willy runs from room to room, the animation is different from before. When he is in a room with the bat, he’s looking visibly scared. 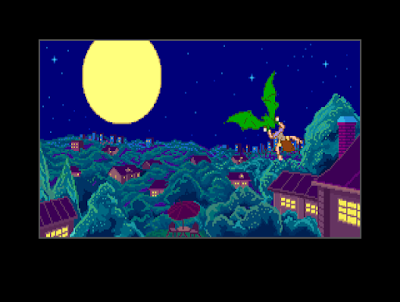 He’s not just standing around with a reused sprite, but reacting visibly to the presence of the bat. When he grabs the mouse, he’s visibly carrying it by its tail when he moves around the room. There have been a ton of little details like this in the game, more than I’ve seen in most games made ten years later. I’m not saying that the animation is perfect by any stretch, but the more I play this game (and replay it to write up the reviews), the more I am impressed by all of the detail-oriented work that went into it. Bravo! Now, back to the action. The new “targeting” cursor in action. I restore and more quickly grab the mouse and hairspray before returning to the living room. Now, I use the cleaner and when Willy is waving around the end pointlessly, I also use the spray can. This actually opens up a bit of UI that we haven’t seen before: a targeting reticule. I can still right-click to get back to the “action” and “look” icons, but now there is a third option. Unfortunately, clicking doesn’t do much. I do get a hint that I need some sort of bait, but using the mouse doesn’t do anything. I’m stuck and die six times in rapid succession. I even re-explore every room, but there’s nothing new there. Brianna is even nowhere to be seen; I hope she’s in a closet or something. I eventually figure it out: I have to use the vacuum, then use the mouse on the coffee table, then target her with the spray can. You hardly even need to target because Alicia just sits there and happily munches on the mouse, making her an easy target. If you use the mouse on the coffee table before you are behind the couch, nothing happens. It’s a bit frustrating and confusing. As soon as Alicia gets sucked into the cleaner, the screen goes black. I replayed this scene several times as I was writing up this review and there’s a huge bug that I missed the first time around: if you use the spray can on Alicia while she is eating the mouse-- instead of the targeting reticule-- the bat disappears and you are stuck in the room without being able to move. You have to restore from a saved game. For all that I do admire the beautiful art and animation, I wish they had spent as much time hunting for bugs as they did polishing scene-specific animations. And you weren’t there, and you weren’t there..
Willy wakes up. It was all just a nightmare… or was it? He has a fever, possibly because of something he ate. His parents tuck him back into bed and Willy sleeps until morning. The third day starts like the previous one with Willy’s alarm clock going off and him going about his morning routine. While brushing his teeth, we are reminded that today is the day you need to pick up the entry blank for the frog jumping competition, so that is helpful. Unfortunately, there is something wrong with the water: it’s turned dark brown. Something is foul in the city of Frumpton, indeed! There doesn’t seem to be a breakfast scene, but Tiffany and our parents are discussing the car crash from the previous day. Cliff wants us to pay for the damages without going through insurance! That is probably the last thing the family needs. Mom wants Tiffany to see other guys, but Tiffany tells her that “she’ll be sorry”. While this is going on, Dad is off at his job interview… and he gets the job! He’ll start tomorrow morning. Willy brushed his teeth with that water? Gotta love a scale with color commentary. I had forgotten about that: I mangled the scale way back on the first day when I was trying to work out how to get the Nintari key. Now I wonder why I did that and what happens if you don’t. The cause seems very separated from the effect, but I’m sure as heck not going to replay all of the second day to find out what happens if I skip that step. There is now a jar of fire ants in the treehouse. I’m sure those will come in handy! Frog jumping is the same as before and it still implies that I can’t win. I’m nervous about this, but I know what to do with the cola so I should be all set. There is a protest march at the town square and the fountain is now completely filled with sludge. The ferry is parked at the dock. Hey, wait. I know you! Tiffany is at the protest… and she’s a goth or a metalhead or whatever subculture we had back in 1991 that dressed like that. Mom is going to be pissed. She pretends not to know me. 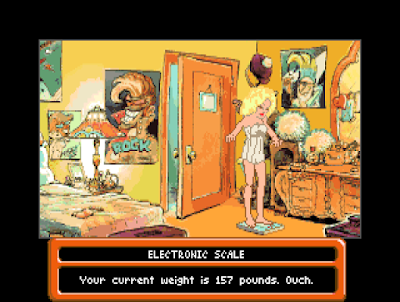 If this is what happened just because I screwed with her scale, I am truly sorry. I had no idea it would lead to a mohawk. I try to get on the ferry, but Gus, the ferry operator, stops me. This is the guy that Perry said collects baseball cards, but I can’t interact with him in any way except to give him a ferry token. I had been quite sure that I would have a way to trade with him to get something that Perry wanted, but no dice. I hope I didn’t miss something the previous day. For example, could I have given Perry the shirt instead of Dana? That might have given be the card, but then Gigi wouldn’t have joined the competition? I’m not going to go back now, but keep that in mind for later. Hey! Is that Pat Morita? As Willy crosses the polluted harbor into West Frumpton, I’m going to bring this game session to a close. The whole vampire interlude was very strange, but pretty fun overall and better than having to play through another evening/dinner scene. West Frumpton awaits and we’ll see what fun adventures Willy has on his third day! After my abject failure last week, I’m going to give a pass to predictions this week except for the obvious: Mom and Dad are going to freak out when they see Tiffany’s new look! Do you think that would have helped? 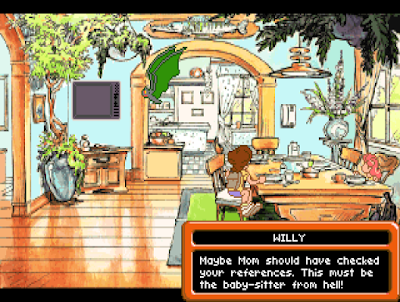 This week is refreshingly free of scatalogical jokes, but I actually did get a chuckle out of Willy complaining that Mom didn’t check Alicia’s references. Something tells me that a vampire babysitter knows how to get around problems like that! I also liked the small Wizard of Oz joke as Willy was waking up. In the back of my mind, I'm positive that Alicia is a reference to some film or television show from the 80s... but I can't quite place it. This game drips with pop culture references, but if this is one it has me stumped. Any ideas? The real "Buffy" movie didn't come out until 1992, so that's not it. This whole babysitter sequence does stick out a bit conceptually - again making me wonder if this game had gone through multiple drafts or visions, perhaps at one stage leaning more on a "kid with an overactive imagination" bit. There, the obvious reference would be Calvin & Hobbes (which debuted 1985 and had become very popular by the time). Calvin, like Bart Simpson, dealt with a disliked babysitter early on (indeed, Rosalyn became a recurring character), though no vampires were involved for either - just a stock storyline when you're writing about a ten-year-old, I guess. I do remember liking the 'urgency' of the sequence, but it would be nice if the puzzle were a little more complex - it's quite a big set piece with the special animations and the cut scenes and then it comes down to a couple of clicks. Oh well. I'd appreciate that idea a lot myself. I think Bridge to Terabithia captured that idea quite nicely. 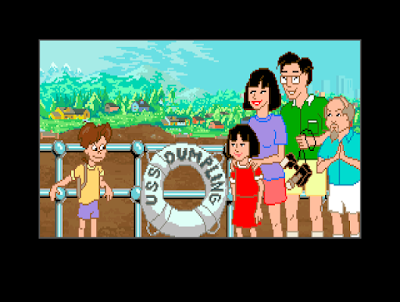 Too bad this game didn't go all the way with it and makes it seem so surreal that it'd even fail as a Sunday Morning Cartoon. Then again, the amount of artwork, multiple solutions and character animations really made full use of computing power in that era. I'd like to bemoan here once more of how I lost my opportunity in playing this game in my early teens because my PC wasn't up to its snobbish expectations. Oh well, seeing someone else suffer through it is why I'm here anyway. I like that Alicia-as-a-bat still emerges with glasses. She may be a vampire, and may have morphed into a species that uses sonar pretty much exclusively to 'see'? But myopia is real, kids! A pity the Bat-(babysitter) from Hell didn't serve Meatloaf.